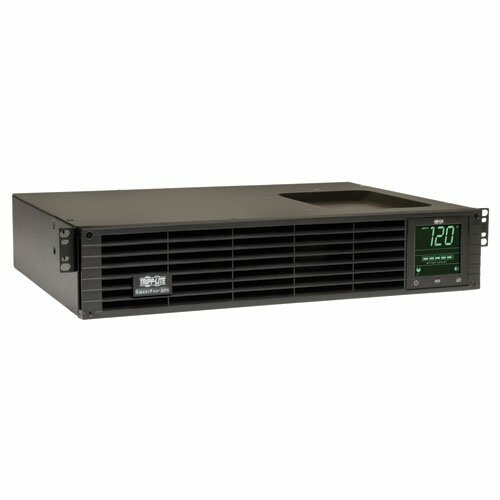 The SMART1500RM2U SmartPro 120V 1.5kVA 1.35kW Line-Interactive Sine Wave UPS provides battery backup and AC power protection against blackouts, brownouts, power surges and line noise that can damage electronics or destroy data. Ideal for backing up servers and network storage devices, the SMART1500RM2U switches to battery mode in milliseconds to keep your connected equipment running long enough to save files and shut down safely with no data loss. Featuring eight NEMA 5-15R outlets (four switchable) and a 10-foot power cord with 120V NEMA 5-15P input, the SMART1500RM2U has an internal battery that provides 13 minutes of support at half load and 4.5 minutes at full load. A front-panel LCD screen lets you monitor important data, such as load level, voltage, battery charge and estimated runtimes. Automatic voltage regulation (AVR) maintains 120V nominal output over an input range of 83V to 147V without using battery power. EMI/RFI noise filtering improves your equipment’s performance and prevents damage. A 570-joule surge suppression rating protects your equipment from harmful power surges. With Tripp Lite’s PowerAlert software (available via free download), the SMART1500RM2U enables safe unattended system shutdown and file saves in case of a prolonged power failure.